The New Versions Preview event will be from January 22nd to February 6th, you will see the introduction of new versions in 2019 and gain some star stones at the same time. Check out the details below. Talk to New Expansion Promoter to learn about the new expansions coming in 2019, there are 4 new expansions. 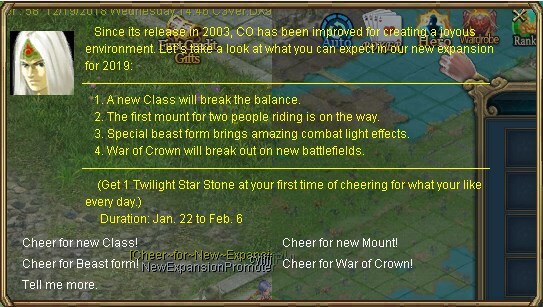 You can cheer for each new expansion to get a Twilight Star Stone. If you cheer for all the 4 new expansions, you can get 4 Twilight Star Stones a day. And to know more detailed information about the new expansions, please click Tell me more. Or you can click here.